The series vs. the A’s kicks off on Orange Friday with Barry Zito facing his former team, and it’s also ’80s Night, with the first 20,000 fans receiving a retro ’80s-style jersey T-shirt. Joe Amalfitano, Dave Bergman, Ernie Bowman, Ed Bressoud, Orlando Cepeda, Jim Davenport, Shawon Dunston, Darrell Evans, Tito Fuentes, David Green, Ron Hunt, Duane Kuiper, Johnnie LeMaster, Greg Litton, Bill Madlock, Willie McCovey, Willie Montanez, Rich Murray, John Patterson, Marty Perez, Mike Phillips, Ken Reitz, Steve Scarsone, J.T. Snow, Daryl Spencer, Joe Strain, Derrel Thomas and Scot Thompson. Before Saturday’s game, the A’s and Giants wives will face off in their annual softball game, always an entertaining event. And the first 20,000 fans will get a neat 50th Anniversary bandana. Sunday’s giveaway is a good-looking Giants water bottle, in honor of CHW’s annual Make Time for Fitness Day. One of the many cool things about AT&T Park is that there’s an official CHW walking course there. It’s a good workout in a beautiful setting, so there’s another good reason to get to the park early. The Giants will officially turn 50, so to speak, with the first pitch of Tuesday’s game at 1:34 p.m. On April 15, 1958, at that same time, Ruben Gomez delivered the inaugural pitch of Major League Baseball on the West Coast to the Dodgers’ Gino Cimoli. Before the 50th anniversary game, Cimoli will throw out the ceremonial first pitch with Giants Hall of Famer Orlando Cepeda, the 1958 National League Rookie of the Year. The pregame ceremony will honor Horace Stoneham, the Giants owner who moved the team from New York to San Francisco, and throughout the game, the scoreboard will feature interviews with fans who recall that first game at Seals Stadium. 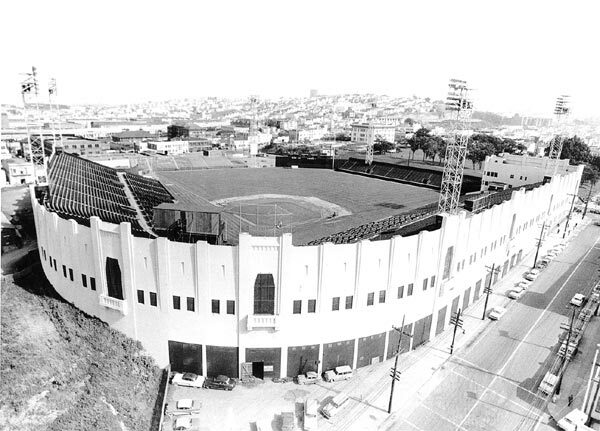 Speaking of Seals Stadium, at 10:30 a.m., the Giants will unveil a bronze plaque at the corner of 16th and Bryant streets, which is where Seals Stadium once stood. Cepeda, Willie Mays, Jim Davenport and Ed Bressoud from the 1958 team will attend, along with members of Stoneham’s family and the sisters of former Mayor George Christopher, who championed bringing the Giants to San Francisco. 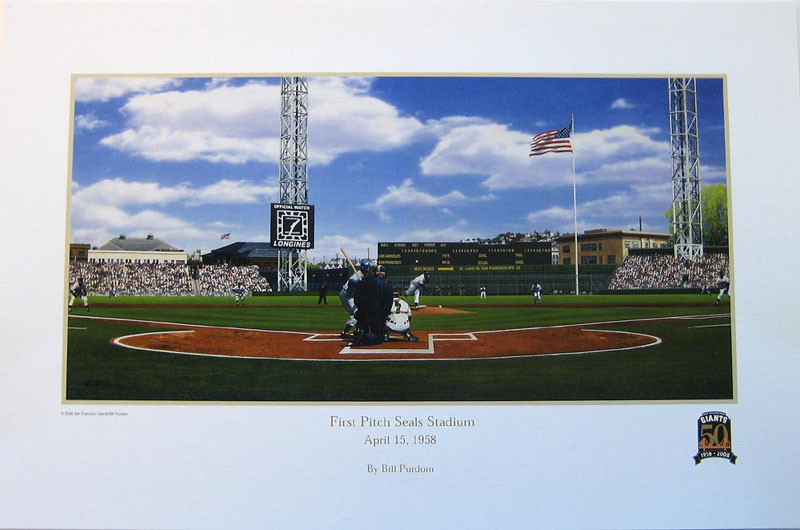 If you’re coming to the game, get there early, since the first 20,000 fans will receive a print of the 1958 first pitch, adapted from Bill Purdom’s original painting. How nice is this print? When members of the media are offered some of the promotional items in the pressbox, like calendars or magnet schedules, a lot of them have little interest. But when the media folks got an early look at this print, they were practically lining up to get them, and at least one person has already purchased a frame for it. After the anniversary game (which is also Jackie Robinson Day), the homestand wraps up Wednesday vs. the D-backs, with fans getting a reusable Giants grocery bag in celebration of Earth Day. It’s an especially timely giveaway, what with plastic grocery bags banned in many San Francisco stores. Little later than I’d hoped, but here’s the 50th anniversary banner they’re giving away at Sunday’s game. Well, the last two nights have shown that you really shouldn’t leave early at AT&T Park, with the Giants getting walk-off heroics from Bengie Molina and Daniel Ortmeier. What’s neat is that all the posters have that strong orange stripe across the middle, so you could put them up end to end across a wall or two. Now that’s wallpaper. On Friday night, the first Orange Friday of the season, get that refrigerator essential the magnet schedule. Another fine addition to your kitchen would be a 50th anniversary commemorative mug, which fans supporting Saturday’s CHW Food Drive to benefit the San Francisco Food Bank will receive in exchange for a donation of nonperishable food items or $5. Sunday is one of the nicer giveaways this season, a 50th anniversary banner. When I saw it at the media open house, I made sure to ask about getting one of my own — it’s really big and colorful and full of great memories (I’ll add a photo of it soon). A thousand Boy Scouts will parade around the field before Sunday’s game, which is also the first Autograph Sunday for kids 16 and under. And as usual, postgame, kids get to run the bases. Tomorrow’s Opening Day at AT&T Park, and the Giants have some neat stuff planned for their 50th anniversary home opener. The gates will open early, at 10:35 a.m., but if you enter between noon and 12:30, you just might receive your Opening Day calendar directly from a Giants player. Two will be stationed at each gate to greet fans and hand out the free calendars. Lineups will be introduced at 12:51, followed by a moment of silence for Kevin Shanahan (the Giants’ massage therapist who died of cancer last November) at 1:01. Jazz artist Boney James will perform the national anthem, and the traditional Opening Day flyover of two Navy FA-18s will come courtesy of Lts. Adam Smith, Andrew Pearson, Jake Huber and Jeffrey Millar from VX-9 squadron out of China Lake, Calif. Plug your ears for that around 1:04. 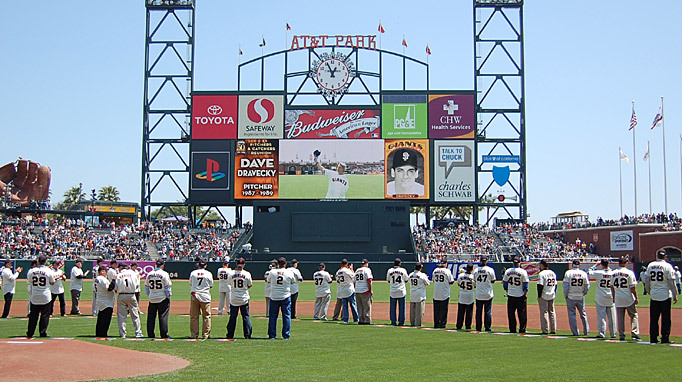 At 1:07, the Giants will kick off their tribute to the 1958 team, the first to play in San Francisco. Felipe Alou, John Antonelli, Ed Bressoud, Orlando Cepeda, Jim Davenport, Whitey Lockman, Willie Mays, Mike McCormick, Stu Miller, Daryl Spencer, Don Taussig, Valmy Thomas and Al Worthington will be there, driven around the warning track in 1950s convertibles. My guess (and I have zero inside info here) is that it has to be clubhouse manager Mike Murphy, who is not only beloved but has been with the team since it came to San Francisco in 1958. He was a bat boy for the first two seasons at Seals Stadium and then became a clubhouse attendant in 1960 before being promoted to clubhouse manager in 1980. First pitch is slated for 1:35, though pregame ceremonies almost always run over. One good omen — the Giants are 6-2 in home openers since moving to AT&T Park in 2000. “Welcome back” — that’s what the ballpark sound system was playing as fans entered AT&T Park for tonight’s exhibition game against the Mariners, the first time the Giants have played at home this year. One of the more noticeable differences tonight is the absence of PA announcer Renel Brooks-Moon, but it’s for a very good reason: Renel has been selected to be the ballpark announcer for Saturday’s Civil Rights Game in Memphis, Tenn. This is a huge honor for Renel, who hopes to be back in time for Sunday’s exhibition finale vs. the A’s. Yesterday, the Giants held their annual media open house, the highlight of which — other than the eagerly anticipated sampling of new ballpark food, which included a phenomenal catfish po boy sandwich from McCovey’s Restaurant — involved the two new luxury suites being built at the ballpark. The Legends Club, located in the left-field corner of the Club level just below the retired number plaques, is a large, all-inclusive entertainment space that can hold up to 120 people. The other suite, the McCovey Cove Loft, is a quirky addition, a 40-person space built into the right-field wall. Fans who sit in Section 150 of the Arcade are probably very happy to note that the “shed” originally constructed to house Rusty, the reviled mechanical man who used to appear at the park, is gone, no longer obstructing right-field views. In the shed’s place is the opening for the McCovey Cove Loft, which sits just to the right of where the out-of-town scoreboard crew does its work. Also new this season will be added food offerings on the View Level, including another outlet of the very popular Orlando’s Caribbean Barbecue (home of the famous Cha-Cha Bowl) and a carvery station. They’ve also installed a glass wind screen along the top of the outer wall, along with a drink rail, so fans wanting to check out the magnificent city and bay views from the View Level concourse will be more comfortable. * If you bring your wireless-enabled device to the park this year, you’ll be able to get instant replays on the in-house WiFi network. Wireless food ordering is coming soon. * The View Level will have a timeline display of photos from the last 50 years of Giants baseball, and 16 new display cases on the Promenade and View levels will showcase Giants jerseys from 1951 to today. Some photos of stuff from the media open house are available here.